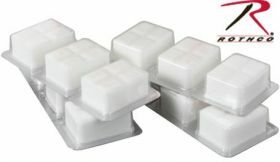 Solid Fuel Cubes for any pocket or folding stove.You can boil a canteen cup of water in about 8 minutes with one of these cubes. Comes in a box of 12 pieces each weighing 14 grams. These fuel tabs are great for emergency use or just out camping. Use one to heat up your water for coffee, hot chocolate, or tea. Keep some tucked away for emergencies. Keep some in your field kit for when you are out camping, hunting, or just scouting around. Lightweight and compact, these are a no brainer for what they provide for you and your family. This is my favorite, a must with or without a stove. These things work everywhere, rain or shine and a square is enough to heat up a whole army canteen cup of water for coffee.